@LadyAquila After the update I had no supplies in my Fresh Survivor bundle (I have not yet purchased any bundles, though will after my council upgrade is done if the supplies are still there). Not sure what happened, because when I logged in this morning the bundle was available but without supplies, and now the supplies are part of it. I'm not going to complain. Actually looking forward to buying it later. & my Bundle is back to Scarred Veteran again.. Dang. I was going to buy the Bruiser one again today! I bought the Fresh Survivor Bundle yesterday.. 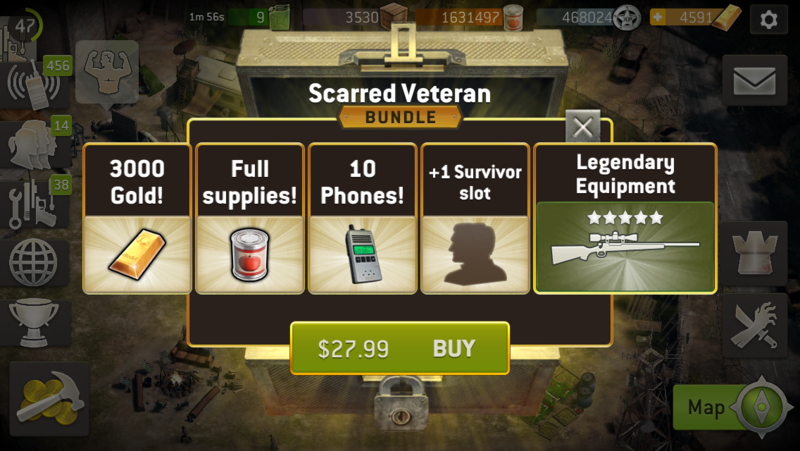 So I think.. For those that did.. Got screwed if the bundle is now offering Full Supplies again, no? 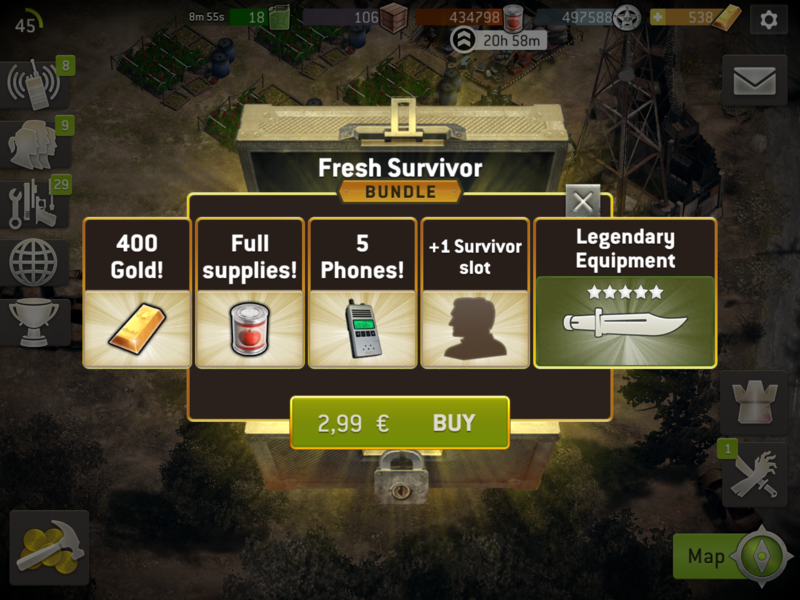 Well, I'm impatient so already bought the Fresh Survivor bundle, but here is the next one, also with full supplies. Does anyone have the Fresh Survivor Bundle that they can screenshot & post please? Awesome @RickGrames ! Thanks so much!! So I had a Fresh Survivor bundle this morning, and now when I go to buy it, it is gone? The Bundels comes and go Recently, First The Full Supplies for The First Two Bundles disappeared, now everything is gone. This intransparancy is really frustating for Most Players. Could U please clarify whether The bundles will reappear, either for The Weekend Event only or for real and indefinately? I saw the full supply as part of the first bundle and waited until I has used all my existing supplies to upgrade my supply areas before biting. Now I have everything in my camp fully upgraded (except my walker pit and outpost which I could care less about since I never use the Outpost function) and have almost 9 million supplies ready for the Council, Workshop and Training ground upgrades when they eventually come along. That was $5 well spent. BTW, all these camp upgrades made me a level 47 player half way to level 48. Why did the bundles I haven't purchased yet completely disappeared wtf???? So is NG going to compensate those that bought bundles w/o supplies, now that they include again? Or do I just add this to the NG screwed me again. I hope not as I'm running out of room on that list! Reading all the comments, it's certainly in NG's interest to provide bundles with restocked supply's. I'd be willing to part with my hard earned cash especially since at £2.99 is a bargain in my opinion. I spend that at Nero's on my vanilla latte! Awesome. Going from great (bundle with full supplies) to okay (bundle without supplies) before it ends with wtf (no more bundles available). Wait . . . I finally buy a bundle yesterday and it doesn't include supplies that are available for people who buy it today? I still see the bundle available. 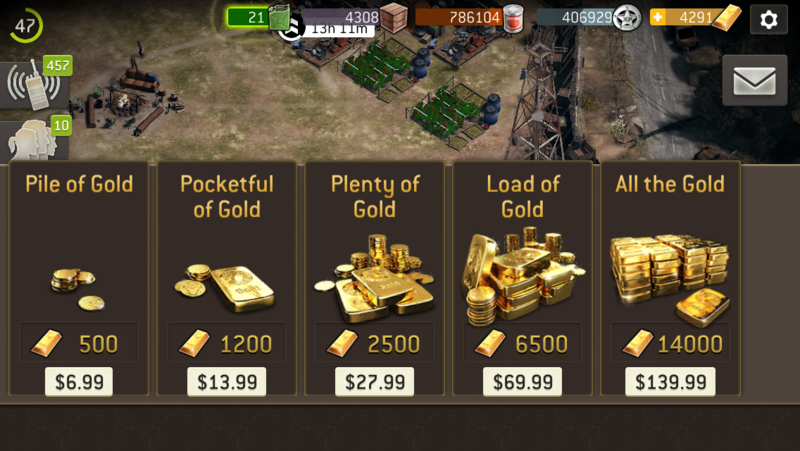 FYI if it isn't popping up when you start the game up, all you have to do is tap your little gold bar up in the corner where it shows your gold count and several packages show up. The bundle is among them. 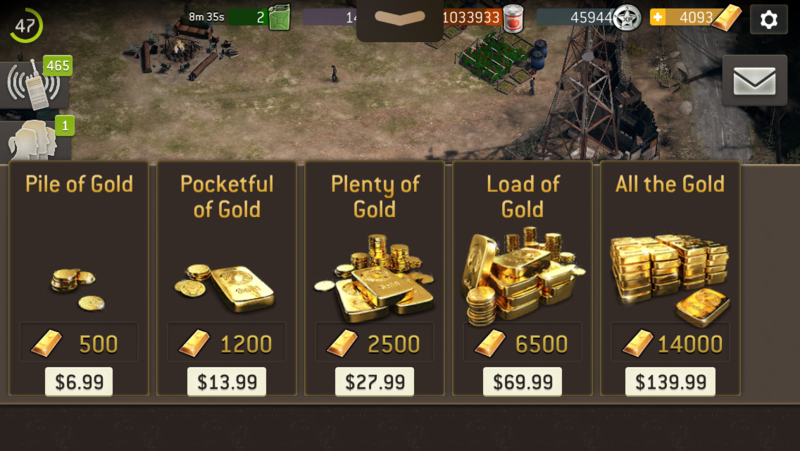 @PimpOfTheDead when I tap the gold bar and the packages show up it is the first bundle available. Whole thing is there. Still $2.99. Just to clarify . . . what exactly does "full supplies" mean? Full farms? Full supply storage? Both? Neither? yes full tomato storages supplies filled. whatever your storage can hold will be filled. So if your stores can hold 1.3 million it will be full. That's why you should use your tomatoes and upgrade something before you buy a bundle with full supplies. The availability and contents of the bundles are always subject to change. If you buy trousers before a sale, does the shop owe you money? So i have 2 accounts here, my alt is showing the fresh survivor bundle but my main isn't, how can i purchase the bundle with my main?? 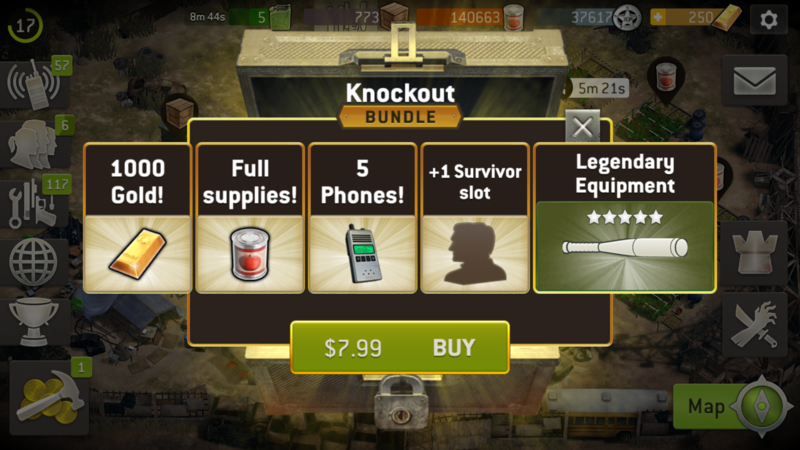 So the survivor bundles briefly include full supplies, then they don't, and then they do again (for most people). And the radio bundle in the "event" have the regular number of radios in them --then later when NG finds out people are angry, they sweeten it with double the radios. Here's a tip, Next Games: People don't want to spend money on a bundle if they don't know that 2 minutes later it has changed to something better. And people who have spent and got the lighter version will be bitter now matter what. Add to that that the legendary weapons in the survivor bundles seem to have random levels (still waiting for clarity?). after bundle complaining yesterday, the supplies were back last night. bug or not, i got them fine. sometimes I wonder where everyone's patience went. My guildie noticed the missing full supplies, I searched here for a thread, found a couple, tagged some mods and staff and waited for a reply. We just waited to buy till we heard back or it reappeared. I still don't think there's been an official statement on what it is supposed to be, and whether I'll be reset to buy the bruiser bundle or have to buy survivor again, so I'm still waiting. It's been two days. I can survive. Then again, I'm old and remember dialup modems.